Today is a new sketch and/or color challenge over at Your Next Stamp! I couldn't help but continue to use my new watercolor pens from Sai in different capacities. I think I am a long way from perfecting this but it has been fun along the way. 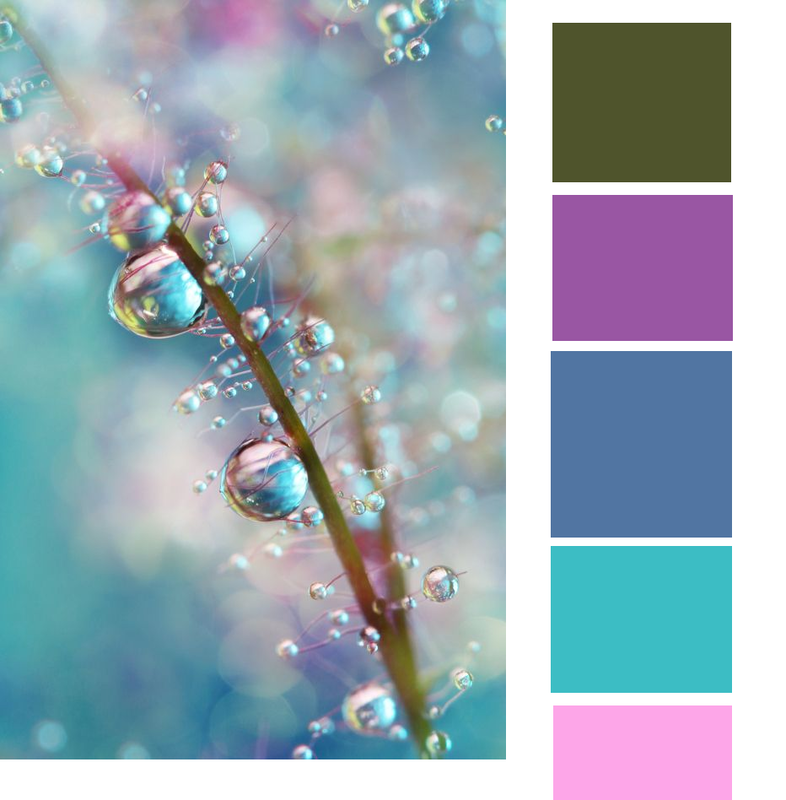 For this card, I am using the colors for this challenge in making a CAS thank you card. I have other designs in mind for similar layouts, but for now, I like using this style with the Fancy Thanks die from YNS. Using some Ranger watercolor paper, I chose the colors I wanted to use and scribbled onto an acrylic block before using my watercolor brush to pick up the color and place onto the paper. For the run off side, I added a bit more water to the end and allowed for the run off by turning my paper on its side. I finished the look with the Fancy Thanks die cut from a piece of card stock that I first ran some Inka Gold over before cutting it out. 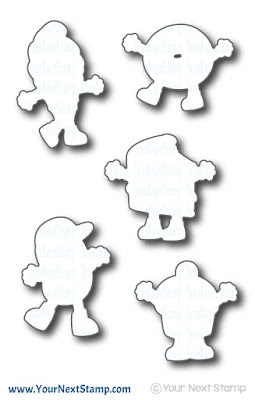 I then ran that die cut through my Xyron sticker maker so that I could have an even side of adhesive. It was then topped with some Gold Nugget Gumdrops. This really was an easy card to do in a short amount of time. Thanks for stopping by and hope you have a great Friday! Hello from the tundra! I am happy to still have power with this snow storm to write this post and share with you this month Feature Day with Your Next Stamp. This month's theme is all about Love. Perfect for Valentines Day coming up and with the newest release, there is so much inspiration to pull from. For my cards, I decided to make my boys Valentines. 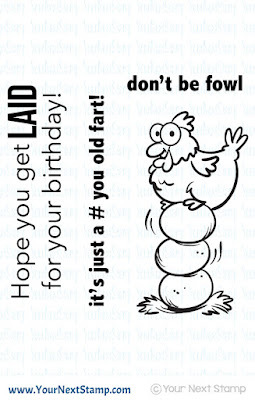 They may be 13 years old, but they still look forward to my little cards I make them every year. I hope they don't get tired of it, but I know that time will come soon. I always try to make them different. Being twins, they like differences. So these cards are 3x3 in size and I used for one, the So Stinkin' Cute set which I offset the image on the card stock before coloring it in with Copics. I added the sentiment to the top right and finished off the heart with some Wink of Stella in clear. For the second card, I used some washi paper for the patterned background before using the scallop from the new release die of the shopping bag treat to pop my layered hearts on top. 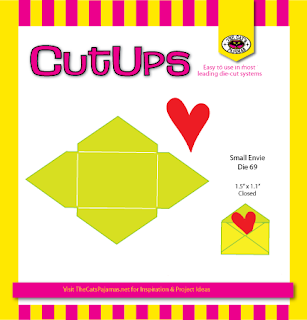 The hearts were cut out using the new release die set of Outline Hearts. Do you dare? Dare to see what the YNS DT have created with this month's DT Dare Challenge? Well, you won't be disappointed. This month's challenge is Something New and Something Old. Definitely something we crafters have. For my creation, I am using the new set of So Stinkin' Cute. And cute he is! This is one of my "new" items but really, it is my new Akashiya Sai Watercolor Brush pens that I have had. And do I love them! 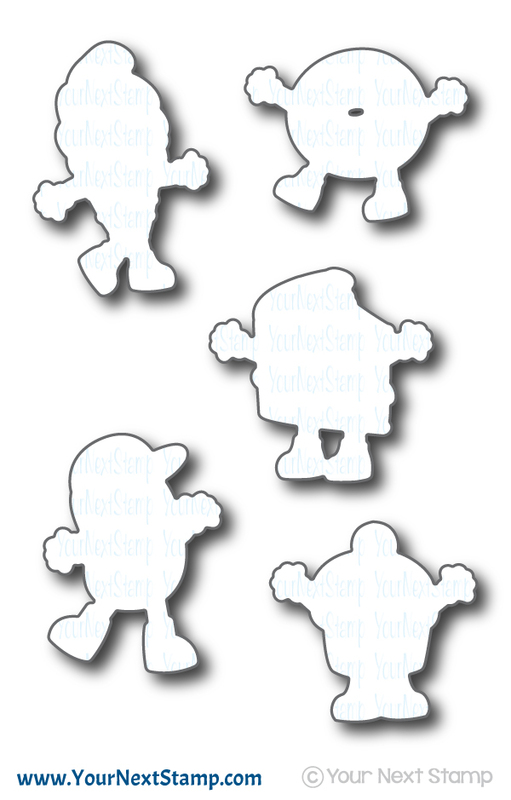 I am looking forward to using these more for coloring. I think I still have a ways to go to perfect it, but for my first time, it was fairly easy to use. Be sure to stop by the YNS Blog to see all the fab creations the team put together with each of their "something new and something old." Thanks for stopping by and taking a peek! Have a great Wednesday! As if the new release and blog hop didn't get you excited about the newest release, I would like to share with you a creation using one of my favorite sets in the store. But when you are done checking this out, be sure to hop along to see what other creations the Kitty Cat pack have put together for this new release. The image was colored with Copics and cut out to be popped up over the oval. I added some white dots using my gel pen to the oval cutout and placed a few star cut outs from the TCP Store throughout. The look was completed with a few rhinestones and the sentiments stamped directly onto the card base. We hope you do play along in the challenge to share off your beautiful creations. Who knows? You could be a winner for a gift certificate to the TCP Store. Thanks so much for stopping by and look forward to seeing what you design! Make it a great one. It's here! The blog hop you have been waiting for after a week of sneaky peeks from the wonderful Kitty Cat Pack! The wait is over and you can now purchase all your favorites. Better yet, just buy the Kitty Pack and you can get everything you have seen this past week. For this card, what I didn't do was take a side picture so that you can see how this card is made. The hearts actually make the end of the front panel. That way, it still makes for a standard card but at the same time, the hearts look like they are free floating a bit and hanging off the edge. 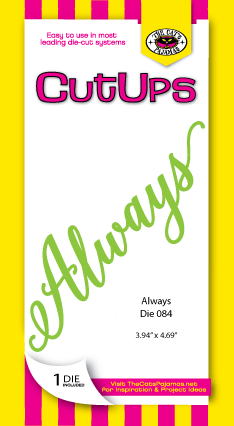 Using the word die, I added some sentiments from the Conversation Hearts stamp set that could be used with the starting word 'Always.' I kept this very CAS for the colors to pop against the white and completed the look with some self adhesive rhinestones. Be sure to head over to Wanda's blog to take a look at her amazing designs for this release. It was exciting to work along side her and so glad she came along on this journey this month! Have a great Tuesday! It's the last day of sneaky peeks for The Cat's Pajamas today! You know what that means? It will be time to have a PJ Party with us tonight and then ready to purchase all the fun sets you have been eyeing. To make this card is fairly simple and makes for a little twist in card giving. To make the bottom pop up, you will need your card stock strip to be about a 1/2" longer on both sides to allow for room when folding. Next, find the center and use the topper die on that spot and cut out. Trim the excess around it and score the fold lines on either side of the word and center. The center being the mountain fold. Adhere the strip to the bottom once you have decorated the inside as you would like. The inside was complete with a few more heart cutouts from the Conversational hearts die while the patterned paper is from EP. 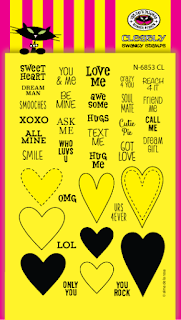 A fun way to make a Valentine! Be sure to leave a little love on the blogs you visit during the sneak peeks. One random winner will be chosen to win a $10 gift certificate to the TCP Store. Thanks so much for stopping by and mark your calendar for the upcoming Facebook PJ Party. Make it a great day! 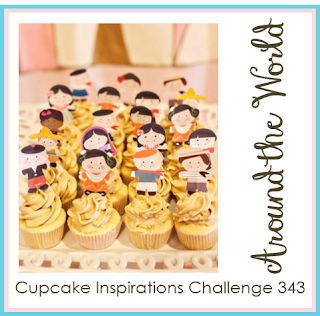 Today is a new Cupcake Inspiration challenge over on it's blog and Your Next Stamp is sponsoring the current challenge. I have created a fun card based on the inspiration using Yippee Fhiona which also happens to be on sale over in the YNS Store. Fhiona was colored in with Copics and fussy cut out to be popped up over the stitched oval. The patterned paper is from Paper Studio and I just thought it was appropriate to have some cupcakes in the card because she is saying Yippee! So why not Yippee to cupcakes? :) I added a ribbon and some ocean mist gumdrops for a finishing touch. We hope you are able to play along for your chance to win some wonderful prizes and to share your beautiful creation! Thanks for stopping in! It's here! The time you get to see all the fabulous projects for the January release with Your Next Stamp during our Blog Hop. This is such a fun release full of various sets to include love, funnies, and cuties. Karen has once again knocked it out of the park with this one. The set I am sharing is once called Cute Foodies. Hee hee... it is perfect for me because I am a foodie and don't discriminate good food of any kind. 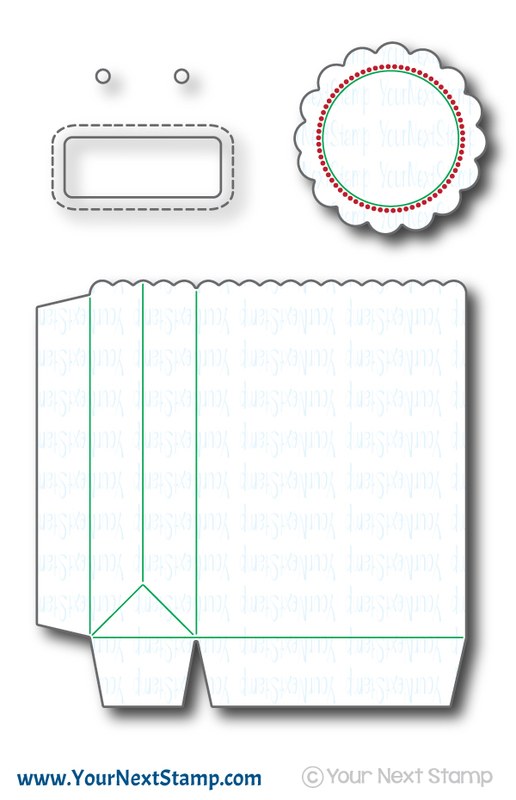 This will be perfect when giving yummy treats out or for making tags to attach to yummy treats. 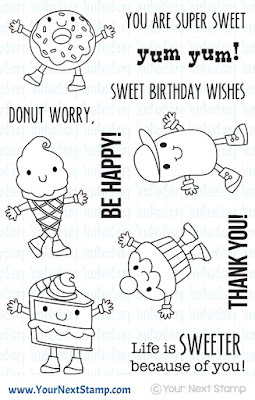 For this first project, it is a card made keeping younger kids in mind. Something fun and I even used the YNS Mini Balloon trio for some added celebration. The image was colored in with Copics before cutting it out with the coordinating die. I popped him up over the Scallop Circle and cut some balloons to attach to the hand. I did used some black card stock to layer over the balloons using the same dies for added dimension. It was finished with some YNS GreenTwine and Gumdrops. For the second project, I am using the new Shopping Bag Treat Bag. This is so fun to use and I keep thinking of all the fun favors or surprise treats I will make with this. I love how this bag has a window and even the holes for adding ribbon already to go! For this, you will need to cut out 2 treat bags to put together. Very easy to do since the score lines are also already incorporated into the die. I colored the image with Copics and again used the coordinating die to cut him out. He is popped up over the scallop while I used the cut out of the window for the sentiment to be placed at the bottom. The bag was finished with some ribbon and of course filled with yummy candy first. Don't forget to leave a little love on each of the blogs as you hop for your chance to win a $25 gift certificate to the YNS Store! A random winner will be chosen on January 20th. 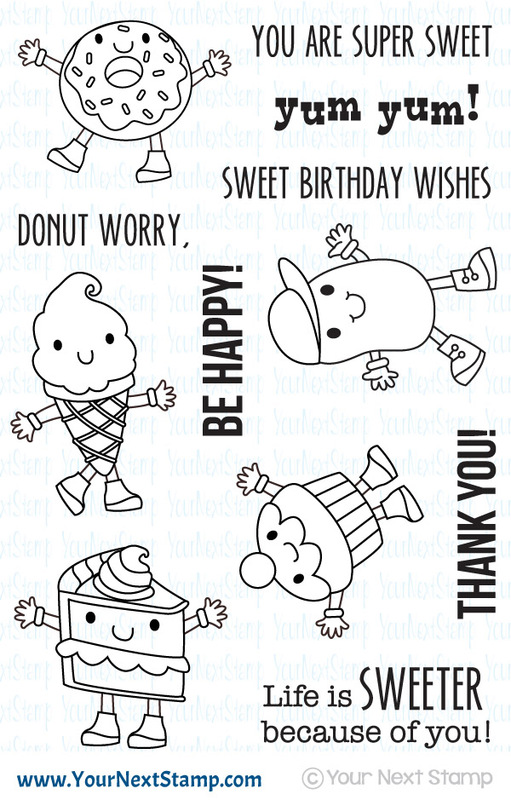 Super fun peek today with another great die being released next week from The Cat's Pajamas Stamps. This die is the Small Envie and it is so much fun. I love that this envie comes with a cute heart die as well and I couldn't resist using it with this sentiment from the Words of Love set. The patterned paper is from EP with the envie cut out with some coordinated papers from it. I popped up the envie and heart while the edges of the center panel were sponged with some Pumice Distress Ink. It was completed with a few rhinestones for some sparkle. Sweet and simple. This is going to be a great weekend my crafty friends! It is the Your Next Stamp January new release! Woot woot! But before we get to that, let's have a little sneaky peek at one of the sets. If you like a good chuckle, you will definitely want to add this set to your list. This one is called Mother Hen and perfect for those milestone or older birthdays. Hee hee... how funny is this? For my card, I colored the image with Copics and and fussy cut it out to be popped up. I added some patterned paper with chicken wire to the end of the opening of the card and topped that with some twine and a button. It was completed with the sentiment stamped directly onto the base card and finished off with some gumdrops. You don't want to miss all the sneak peeks the DT have created, so be sure to head over to the YNS Blog with you pen and paper. That way you are ready to jot down all those sets you can't live without! Thanks for stopping by and hope you have a great weekend. It is day 4 of the January sneak peeks for The Cat's Pajamas Stamps. Continuing with the theme of love, today is no different getting you ready to create some fabulous Valentines. Here is the inside and how it looks open. I added a strip of patterned paper to the sides of the card for an added look and completed the look with some sequins. After the hearts were partially cut, I added a cut out from the coordinated Conversation Hearts die set that matched to the partially cut. The stitched inside was stamped on to the heart and the sentiment was stamped directly onto the front base and on the inside. A CAS card using this fun set, but there are so many possibilities! For some added inspiration, be sure to stop by the TCP Blog to see the Kitty Cat Pack's fabulous creations. Today is a Friday Challenge with Your Next Stamp and I have chosen to follow this fun sketch using both sets of Coffee Right Meow and Java Geek. The patterned paper at the top was cut out using the YNS Stitched Oval set, while a circle punch was used for the back panel. I colored the image from Java Geek and cut him out to be popped up over the circle and bottom panel. The smiling face is from the set of Fun Faces 2 while the sentiment is from the set Coffee Right Meow. The card was completed with a few buttons with twine and a heart stamped in red. I hope you have had your coffee, or favorite morning beverage this morning, and are ready to tackle the day. Be sure to stop by the YNS Blog to see all the fun creations made by the DT and get ready to upload your creation to play along!